During a recent snowfall, I was reminded of snow days growing up. Snow meant that we got to play outside all day long, and it was just so exciting to wake up and see snow falling! 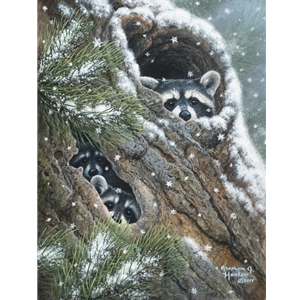 This little troublemaking crew of baby raccoons has just woken up from a long winter nap and are climbing over each other to get a peek at the fresh snow falling. Soon they will decide to venture out and play in the snow!! !